We’re going to dog camp! So I decided to try a new adventure this year for the Labor Day holiday weekend. I’m taking the girls to Goldstock Camp. I know. It sounds like a camp for wannabe financial investors, or another one of Donald Trump’s money-making ventures. Well, from what I’ve heard, it’s a wild weekend full of dog hair, paw prints, games, new friends and no sleep. No, really, it’s a gathering of hundreds of Golden Retriever lovers and rescue groups—and their dogs, of course—at a youth camp facility, Camp Weequahic, in Pennsylvania. There’s going to be dog competitions, contests, live and silent auctions, remembrance ceremonies, demonstrations and education sessions. What I’m looking forward to most, though, is an entire weekend where my dogs can be off-leash, swim in the lake and romp with hundreds of other dogs. 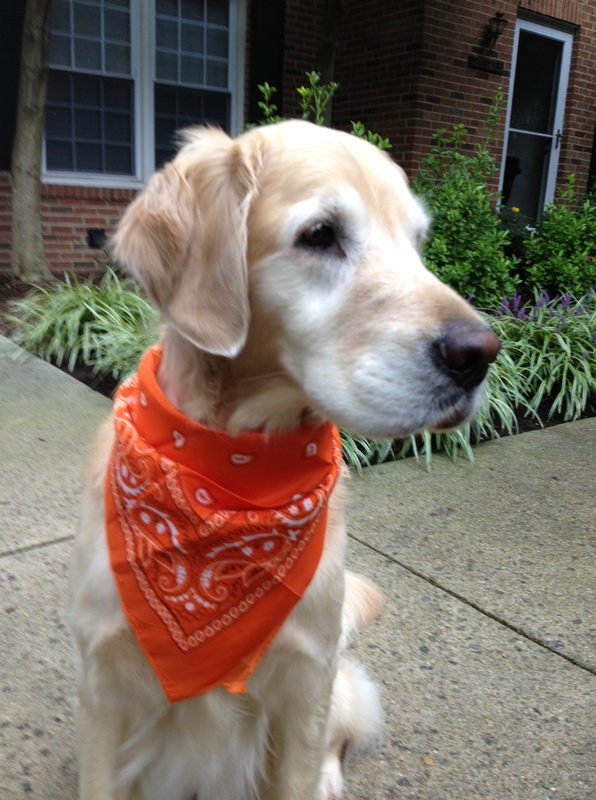 I am bringing a bright orange bandanna for Chatham to wear, however. I can only imagine “Which Golden is mine?” is probably a commonly-voiced concern at this event! I understand that GRREAT (Golden Retriever Rescue, Education and Training) the Golden rescue group that I volunteer for, has the largest contingent attending. I’m looking forward to meeting other volunteers from GRREAT, as well as rescues from around the country. And I want to thank Carolyn, GRREAT’s events coordinator, who’s a Goldstock veteran and gave me lots of advice! Camps where people can bring their dogs seems to be getting more popular, another one I’ve thought about trying is Camp Unleashed, which has camps in Asheville, N.C., and the Berkshires in Massachusetts. And this USAToday article from a few years back describes a few other camps from around the U.S. I am so jealous! Have fun! Sounds like fun!! Looking forward to hearing how it works out.